The Syneron eMax is new, in the box – with less than 100 shots. A complete solution for a wide range of aesthetic laser treatments, including acne, hair removal, skin rejuvenation, wrinkle reduction and much more. Powered by Syneron’s exclusive elōs technology, which combines bi-polar radio frequency and optical energy, the Syneron eMax system is one of the most versatile cosmetic lasers you can buy. 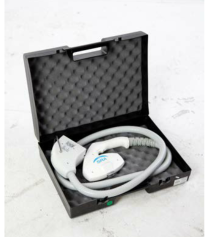 It can handle just about any aesthetic application, and it can do it with remarkable speed and patient comfort. The eMax system is easy to upgrade at anytime, and unlike many other systems, it can be upgraded without the need of tools or technicians. All you need to do is simply plug in a new applicator. This model can be used on virtually any skin tone or texture and it offers an extremely large spot size of 12 mm x 15 mm for ultrafast hair removal. 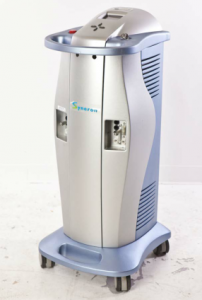 Contact UsedCosmetic.com for the best deal on a pre-owned Syneron eMax. Never been used, except for testing. UsedCosmetic.com has one of the largest inventories of cosmetic laser equipment, and we stock the complete line of Syneron models. 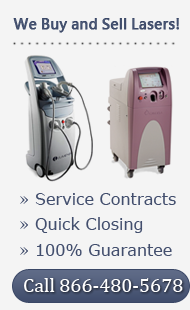 We only sell top quality refurbished cosmetic lasers that have passed our rigorous reconditioning and inspection process. That’s why we can back every system we sell with a full satisfaction guarantee so that you can buy a used cosmetic laser with complete confidence. To get the lowest price quote on a Syneron eMax cosmetic laser, just fill out the contact form below and we’ll respond back promptly. There is never any obligation to request pricing details or ask for more information.